The Spark Arts for Children is a registered charity (number 1106952). This means that all the money given, raised or earned is not distributed as profit but kept and reinvested in the work that we do. We are reliant on the continued support of our audiences, funders, business partners and donors to ensure that we can continue to develop our artistic and educational work to ignite the potential of all children. 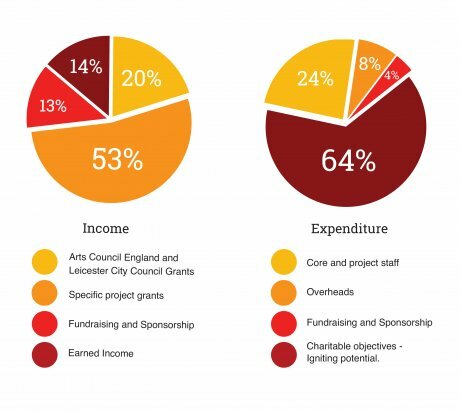 A breakdown of our income and expenditure, for last year, can be found in the pie chart images below.